I’m incredibly excited about the job taking me there, the house we’re moving to, and the chance to try something new, but it’s hard to leave a place I’ve lived half my life (almost exactly to the day). This, of course, calls for cake. 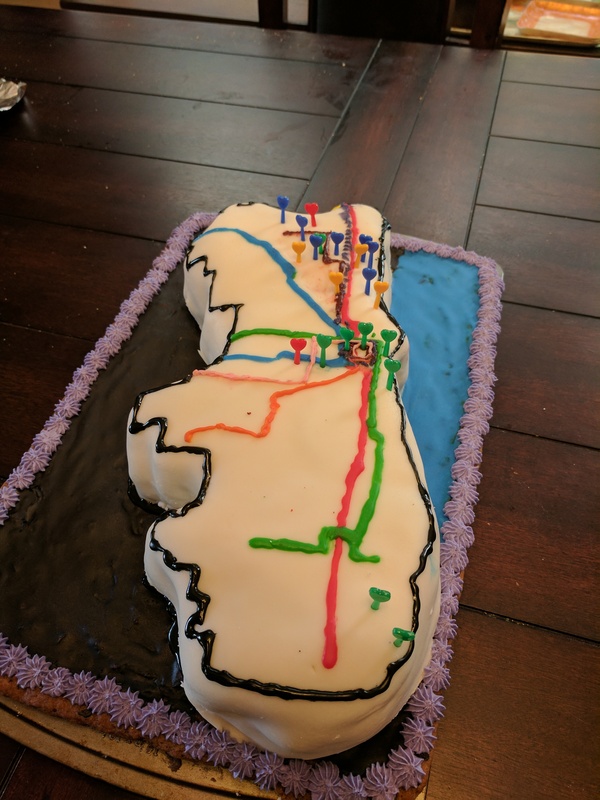 How do you cake a place you’ve lived for 18 years? I went through a lot of options — the skyline, Chicago iconography (the flag, maybe? ), our house itself (which I love and am selling), but it soon became clear a map would be most appropriate. 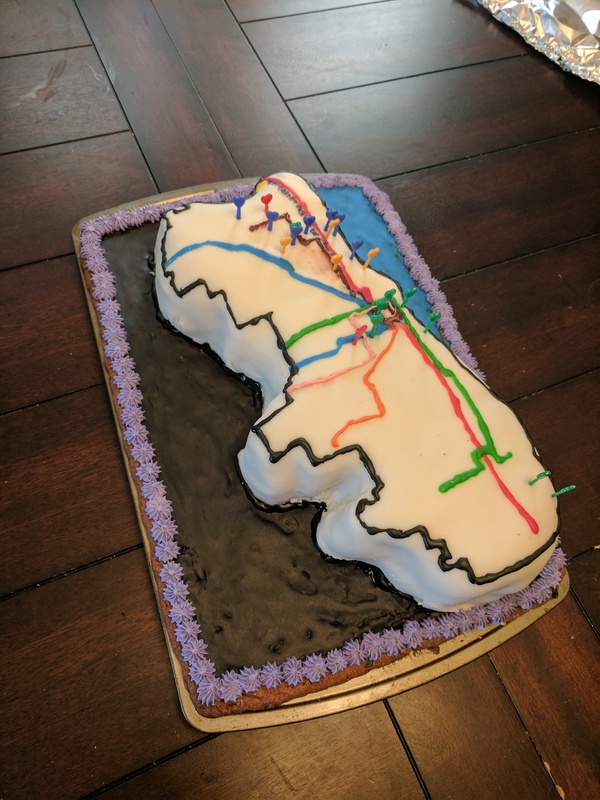 I did, after all, write a dissertation about the ability of maps to evoke people’s personal connections to places. 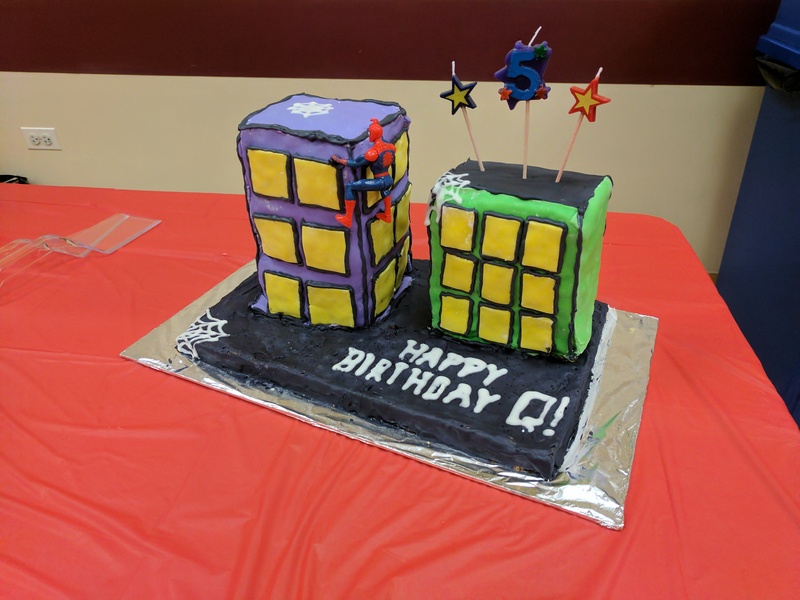 For my son’s 5th birthday cake (that I never got around to writing about), I used a cookie base to support the buildings Spiderman was climbing. The cookie base gave me a way to anchor the buildings without worrying they’d squish a base cake and topple. 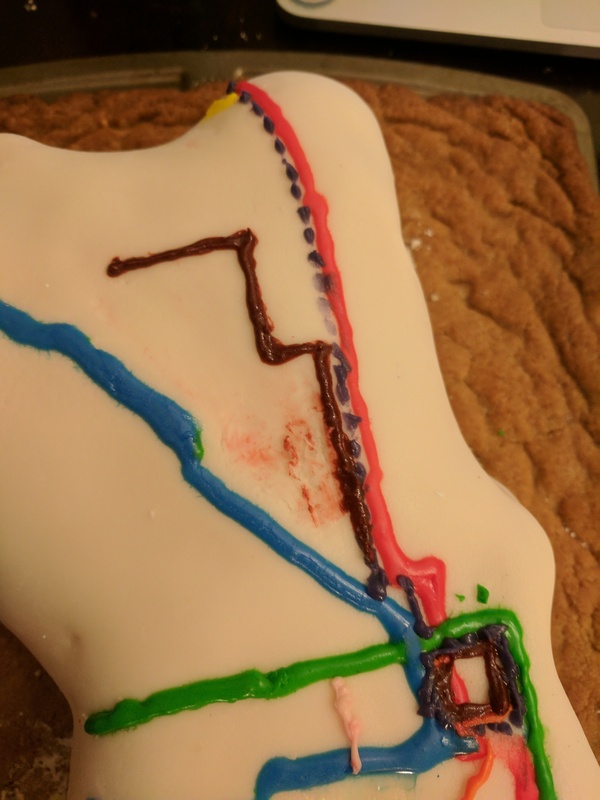 Most of our memories would be in the city, but I wanted the opportunity to put some annotations in the suburbs, so I did a cookie base again: white chocolate chip cookie in a jelly roll pan. 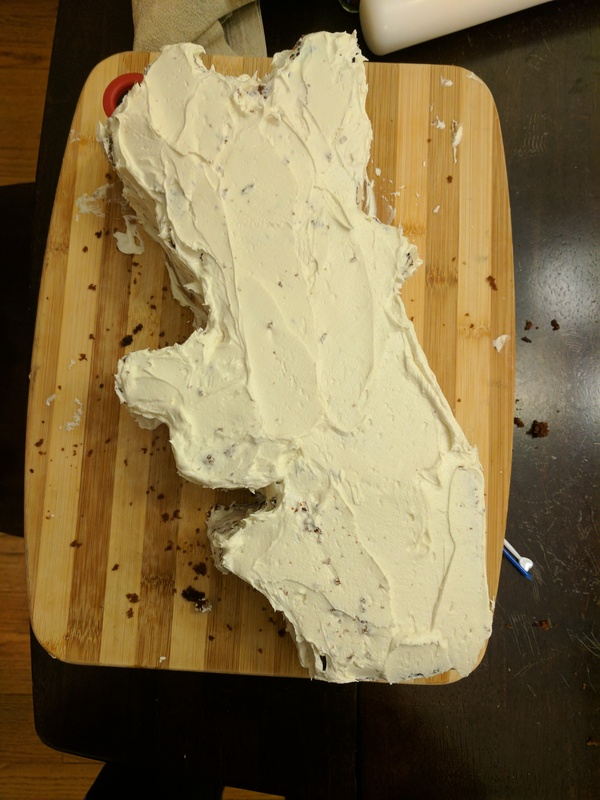 Not actually knowing how many people would be coming over to eat this cake, I guessed that a 9×13 pan would be about the right size. 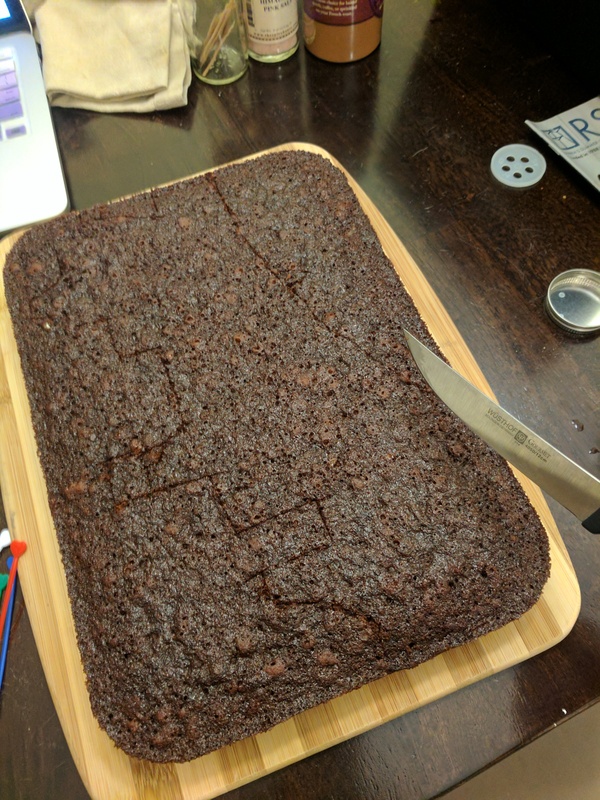 As an homage to the (estimated) thousands of pints of Guinness we’ve consumed here over the years, I went with my classic standby Guinness Ginger Cake. 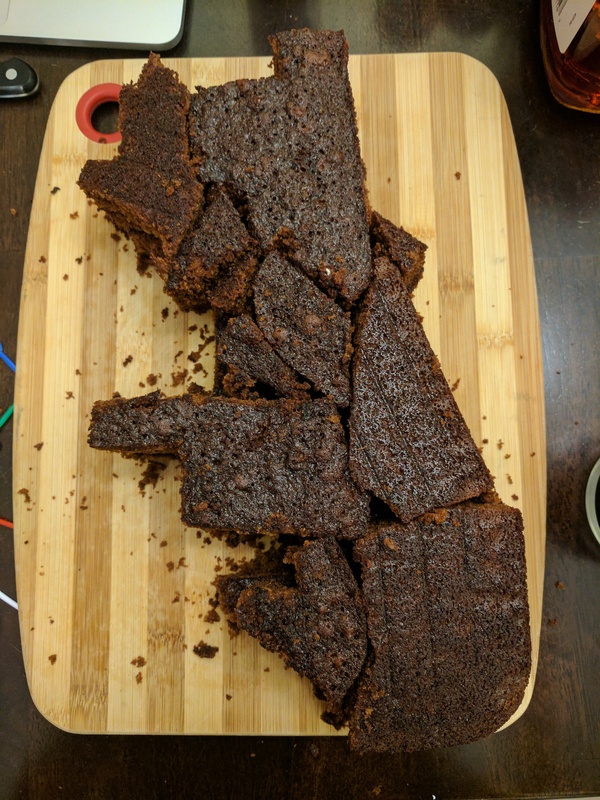 The spiciness balances out well with all the frosting I was about to pile onto it, and it’s firm enough to hold the intricate cuts I was going to need. I pulled up a map of the city on my laptop and roughed out an outline. 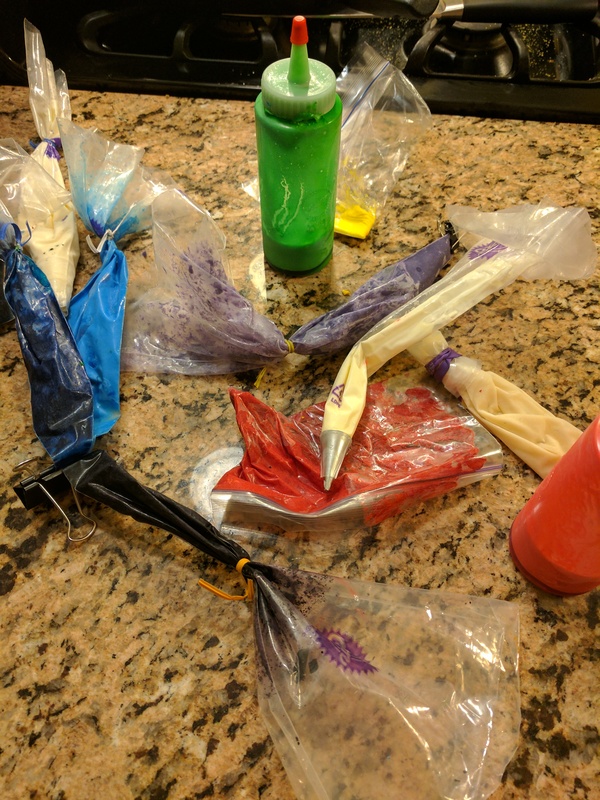 It’s always a little scary right before you take a knife to the cake when you are too close to the deadline to have a backup plan if it goes horribly awry. I paused a moment to contemplate whether the scraps from this cut would be enough to build the second layer, as I was planning. It looked like probably not, but close enough to justify not scaling it down and redrawing the lines. It was close, but it worked! Zero scraps and a few gaping holes. As a bonus, I liked that the shaky underlying structure makes a pretty good metaphor for financial health of the city and state. 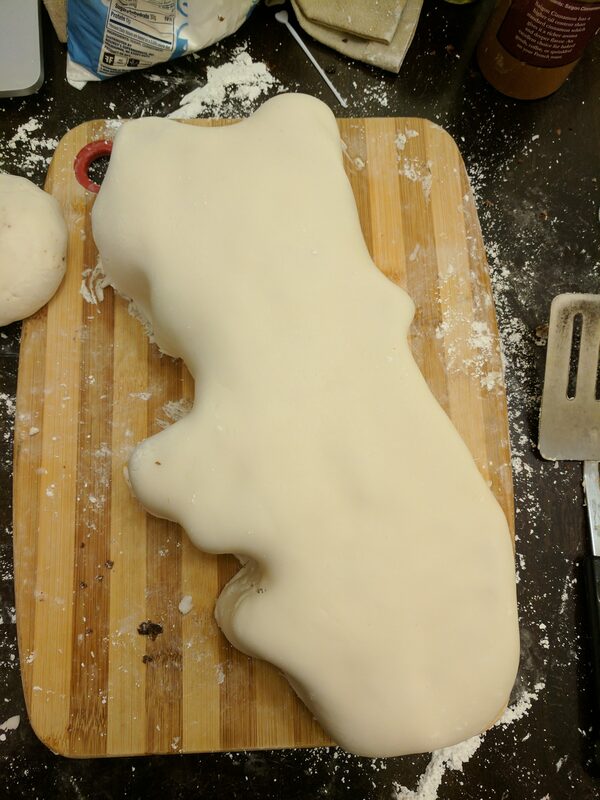 I patched the holes/glued it all together with white chocolate buttercream and covered it with fondant. As I’ve written in quite a few papers (and, quite frankly, is pretty obvious), map readers need landmarks to help them relate the data represented on a map to lived experiences and locations. 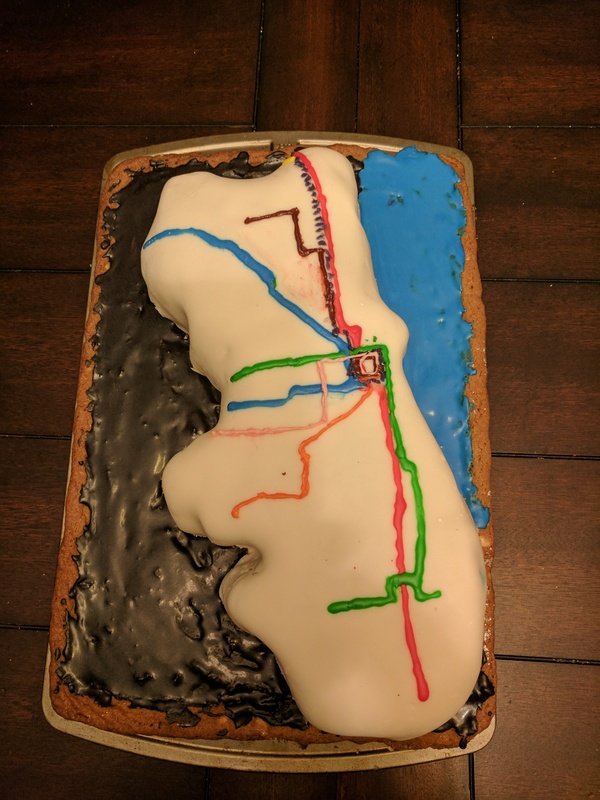 The el transit system is an obvious choice for its importance in our time here and also its ability to help with another subgoal of this cake: clearing out some of the frosting from my fridge. Almost all of the el colors were already mixed; I only needed to combine a few for orange, pink, and brown lines. I started with the red line for its simplicity (mostly straight) and because it spans almost the whole city and would help anchor the other lines. It looked awkward on its own. The other lines went in pretty easily, except for the brown line, which I mis-routed despite the fact that it is the line I have ridden by far the most in my tenure here. I tried my best but couldn’t clean up the smudges. 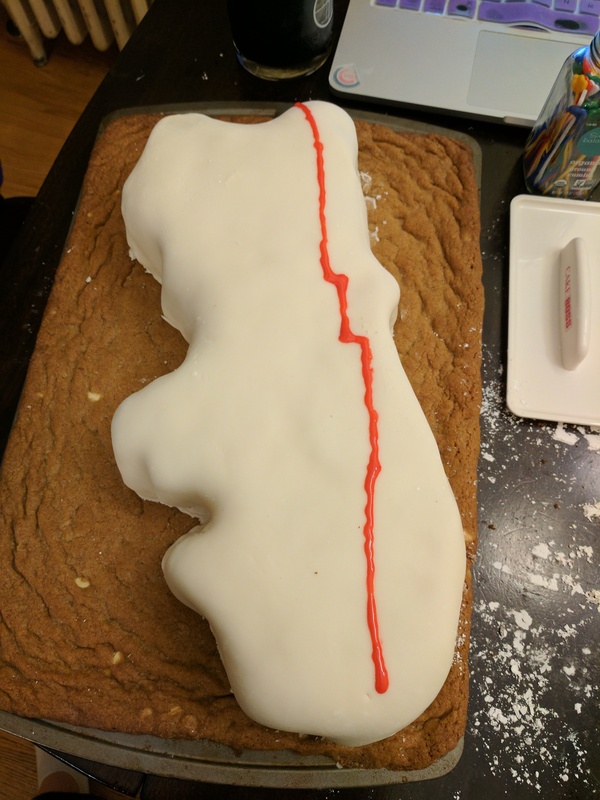 I used the remaining blue icing to fill in the lake on the cookie base and mixed the rest of the royal icing colors to black out the suburbs (which I decided I had no inclination to annotate after all). A black outline of the whole city gave it a nice clean finish, and then I added markers for some of the key locations, color-coded of course. Blue for homes, green for workplaces, yellow for favorite spots, red for extra special spots. It was a delicious tribute to our time here. We had friends and colleagues from all different parts of our lives over to enjoy it with us. Unfortunately at the party I remembered to take photos of the cake but not the people eating it. Now the party’s over and it’s time to pack. Thanks for the memories, Chicago. Such strength — to let people eat that magnificent creation!